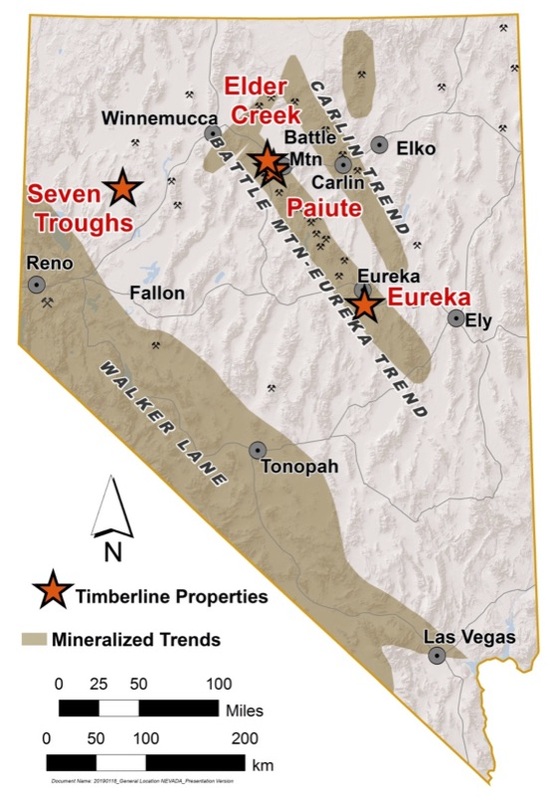 Timberline Resources explores for gold and copper on district scale properties in northern Nevada. Butte, Bingham, Refugio, Batu Hijau, Yerington, El Savador, El Teniente, Resolution, Ann Mason, Alumbrera, Morenci, Sierrita, and others. Eureka is a Carlin-type gold project with historic open pit-heap leach production, and high-grade underground mining. The district scale property holds a NI43-101 gold resource which is open to expansion in all directions. Our primary exploration target is a multi-million oz gold deposit associated with recently recognized high-grade mineralization. Our fourth project, Seven Troughs, is a low-sulphidation epithermal-type gold-silver deposit. Historic pre-World War II mining produced gold and silver at approximately 1 oz per ton Au, and 4 oz per ton Ag from narrow, high-grade veins. The target on this early-stage project is a bonanza-style gold-silver deposit representing on-trend and depth extension of historic mining.